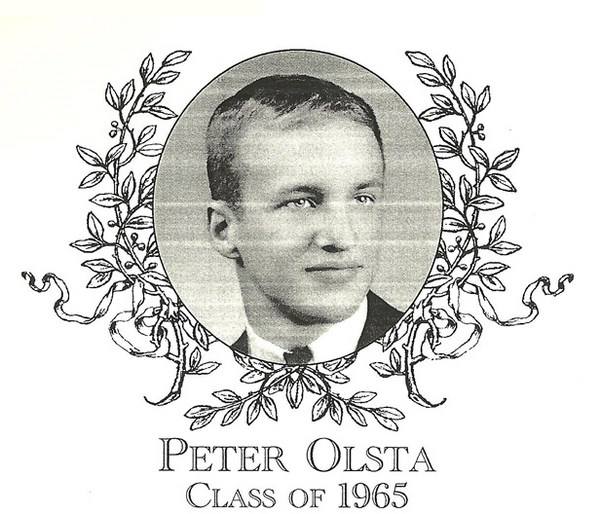 Peter Olsta was an outstanding three-sport athlete at Bartlett in the mid-1960s. In the fall, he was the star quarterback of the highly successful 1964 football squad. He was an excellent passer and decision maker; with complete command of coach Don Ferrari�s complex multiple offenses. In the winter, Peter captained and played power forward for the basketball team. His inside presence was a constant for the Indians. He was one of the team�s leading rebounders and scorers, and he was also known for his tenacious defense. In the spring, Peter had an opportunity to play his strongest sport � baseball. He was a three-year starter at shortstop for the Indians and was named captain in his senior year. He was a terrific defender with excellent range at shortstop and was very adept at turning the double play. On offense, he was one of the squad�s top hitters on a very strong District-bound team. His former coach and coaching legend Ziggy Strzelecki, described Peter as solid offensively and defensively and could be counted on to come up with the big play. At graduation, Peter was presented the Hebert C. Branch Medal. This award was given to the top Bartlett athlete who epitomized hard work, dedication, and commitment to Bartlett athletics. Peter worked hard to achieve success at Bartlett, and he continued his athletic career at UMass-Lowell. Peter played four years of college baseball earning him the Lester Cushing Award for his outstanding play on the diamond. During his freshman year he batted .415 � an average that put him 15th in the nation. Peter also was invited to play in the prestigious Cape Cod League. Peter and his wife, Carol, reside in Ghent, NY, where he is employed as marketing manager for Pittsfield Plastic Engineering. They have two daughters, Lisa and Michelle.